Can you supply colour cartridges for this colour photocopier. Unfortunately we do not stock colour cartridges for this machine. I do apologise for all the inconvenience caused. If we can be of any further assistance please do not hesitate to contact us again. Looking for a drum cartridge for a Xerox WorkCentre 5225. The part I want is 101R00435 or compatible part. Would you have this in stock? Unfortunately, we do not stock an item for this printer with the code 101R00435. The only item we have available for this printer is the genuine Xerox 106R01306 black toner cartridge as shown above. I want to buy a maintenance kit for my Xerox WorkCentre 5225 printer. Can you help? The Xerox WorkCentre 5225 is a multifunction copier with optional printing, scanning, and walkup fax features. It produces as many as 25 copies per minute and it is equipped for heavy-duty work up to 75,000 impressions per month. 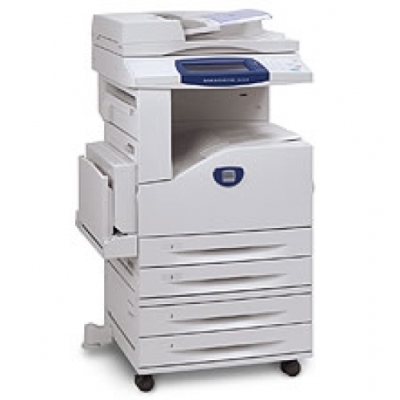 The Xerox WorkCentre 5225 copier model only offers copying as a standard function, and it does not offer any connective features, as it only functions as a standalone device. Finishing options are also available, though these add-ons cost extra. The Xerox WorkCentre 5225 black and white MFP is a compact unit, measuring only 25.2x25.7x49.8 inches. It has a standard paper capacity of up to 1,100 sheets, but the additional paper trays increase its capacity to 5,100 sheets. The Xerox WorkCentre 5225 multifunction printer offers automatic duplexing and it has an ADF for processing multiple page documents. It is built for high-resolution printing, producing maximum resolutions up to 1200x1200 dpi. The best selling points of the Xerox WorkCentre 5225 tabloid black and white multifunction printer include its faster print rate, which averages 25 ppm and impressive print resolutions. Scanning, faxing, and printing are optional, and while the WorkCentre 5225 printer only offers monochrome operation, full colour scanning is supported on its printer / scanner / copier models. A low cost-per-copy is offered by the black Xerox WorkCentre 5225 print cartridge which yields up to 30,000 pages. On the other hand, the Xerox 5225 black and white copier can be quite expensive upfront, especially when opting for models with the full range of functions. Nevertheless, the WorkCentre 5225 workgroup printer is an excellent choice for growing offices, especially those in need of an all around device to handle all their document production and office communication needs.